Russia’s failure to make the semifinals at the 2006 World Championship in Latvia marked the replacement of coach Vladimir Krikunov with the CSKA Moscow tandem of Vyacheslav Bykov and Igor Zakharkin. Bykov and Zakharkin brought a more player-friendly philosophy to the national team. The fact that the World Championship was to be hosted by Russia put great pressure on the players and the new coaching staff alike. Russia began the tournament on fire, with the Ak Bars Kazan unit of Zaripov-Zinoviev-Morozov-Proshkin-Nikulin playing at a level not seen since the days of the Krutov-Larionov-Makarov line in the 1980s. The team easily overcame Ovechkin’s one-game suspension for a hit on a Swiss player and played its best game against the Czechs in the quarterfinal on Victory Day. 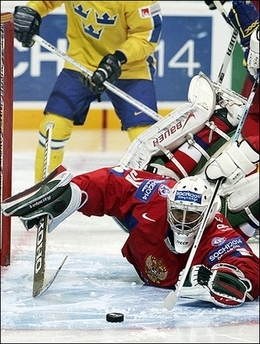 In the semifinal, Russia struggled to get the puck past Finnish goaltender Kari Lehtonen. Saku Koivu scored the winning goal in overtime by lifting Eremenko’s stick to let the puck free and jam it in. After the shocking semifinal loss to Finland, Russia regained its energy and disciplined play to quickly rebound in the bronze medal game against Sweden, scoring two goals in the opening period. After giving up the game against the Finns, goaltender Alexander Eremenko delivered a heroic performance to finish the tournament with a .957 save percentage. Evgeni Malkin, Andrei Markov, and Alexei Morozov were named to the tournament’s all-star team. Markov and Morozov, both of whom finished the tournament injured, were named Best Defenseman and Best Forward, respectively. The 2007 World Championship was only the beginning of a resurgence of confident offensive and defensive teamwork by Russia under Bykov’s coaching.